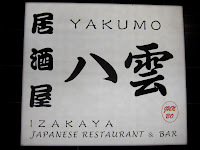 I got a Twitter tip from a reader I trust to check out Yakumo. 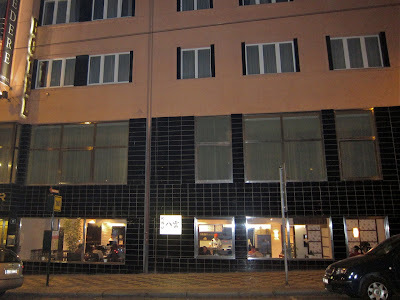 I read good things about it on the Czech foodie guide, Scuk. Hospodářské noviny called it "breathtaking." So I went and I liked it. But you shouldn't go. Not because I'm selfish, but because you are not wanted. I'll explain later. The bar and restaurant opened in August in the Hotel Belvedere. 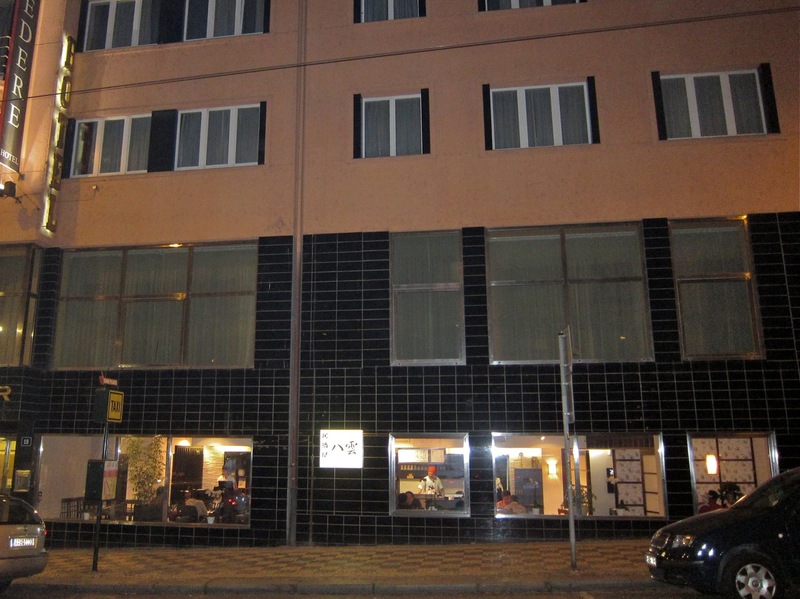 It's located at street level on Milady Horákové between the Kamenická and Strossmayerovo náměstí tram stops. Over the doorway, is a noren, a traditional fabric curtain. 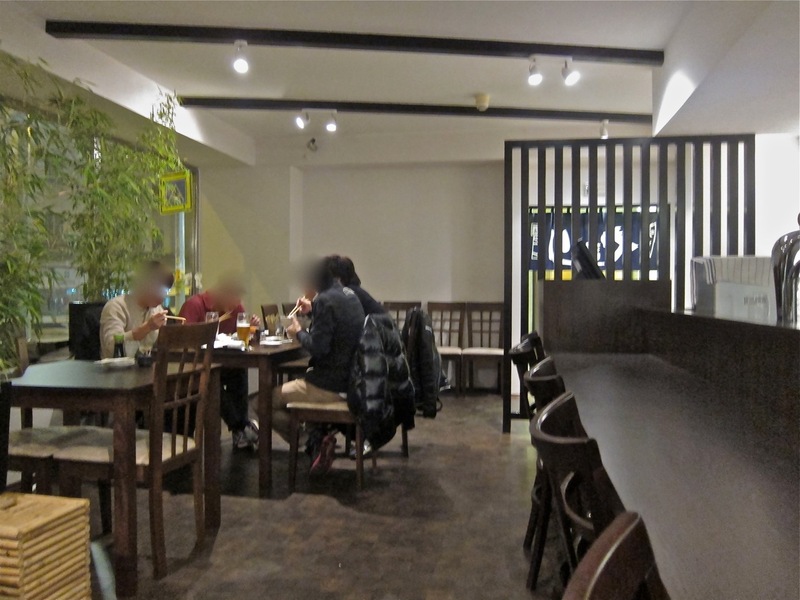 The dining area's design is sparse and simple and feels quite Japanese. 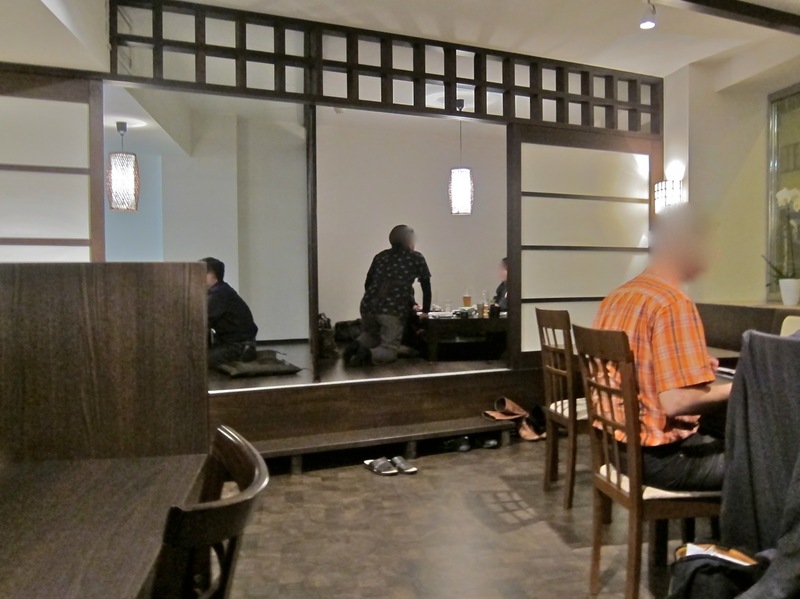 The restaurant is quite small with only five or six tables, a long bar, and two semi-private rooms on the back with rice paper walls. The majority of the customers were Japanese. Everyone should be aware that smoking is allowed throughout the restaurant and it did get irritating at times. 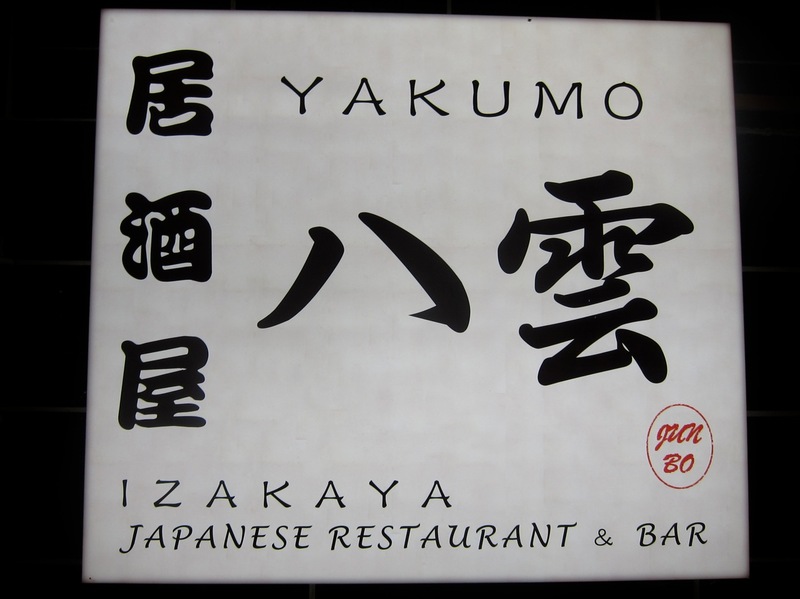 Yakumo is an izakaya, which is a bar that serves food. 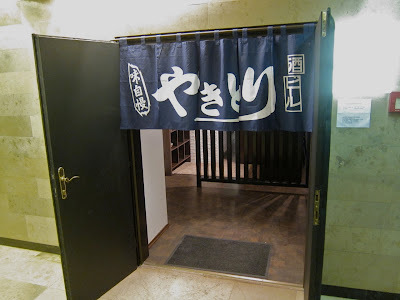 The menu lists 14 kinds of sake from 90 to 4700 CZK. There is also Pilsner Urquell Kozel Dark at 50 CZK for a half-liter and Gambrinus for 40 CZK. 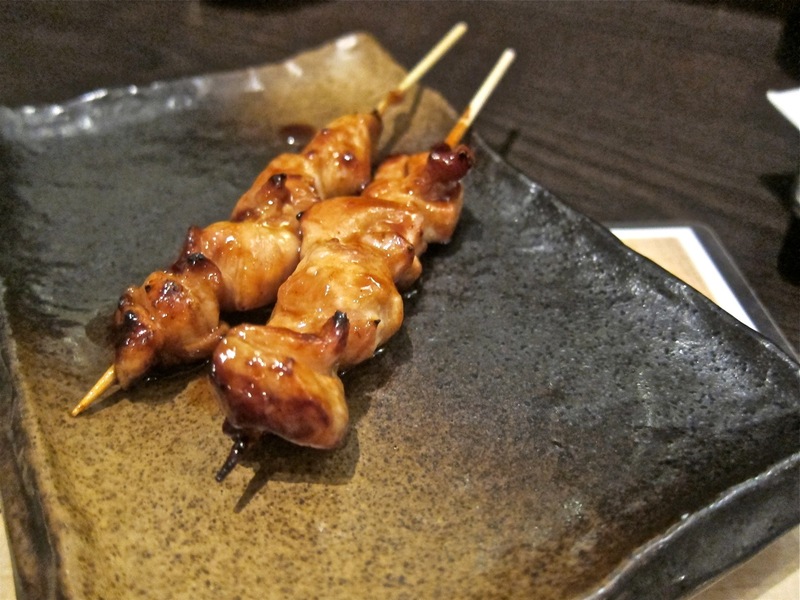 The restaurant serves yakitori, which are various types of grilled chicken including offal. 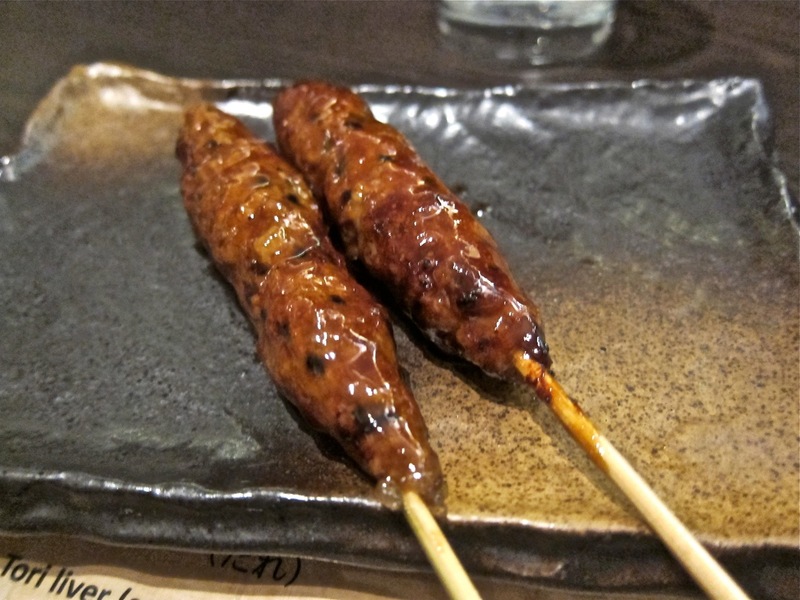 But they also have pork and beef skewers. The chef cooks them on a grill behind the bar. 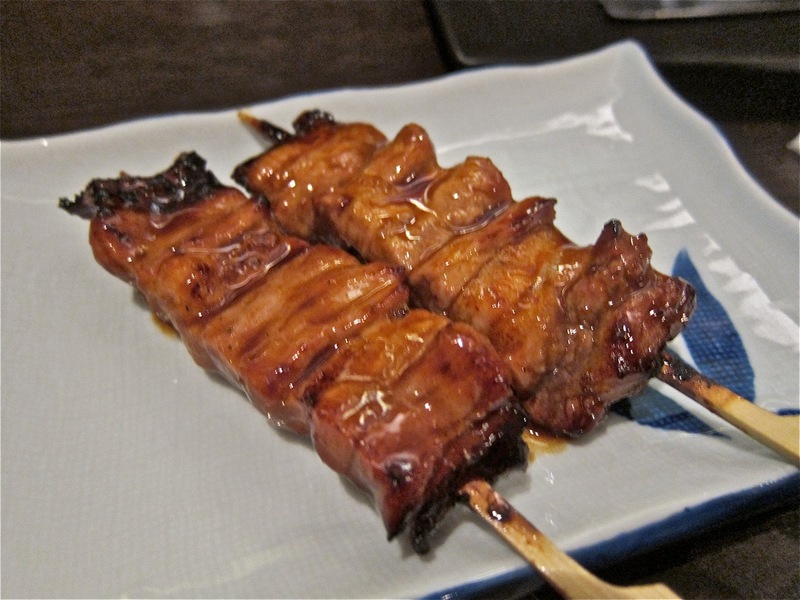 The meat on sticks can be served with just salt or tare, which is a sweet teriyaki sauce made according to each chef's recipe. Neither I nor my friend was drinking, so we both had .2 liter glasses of mineral water (20 CZK each). 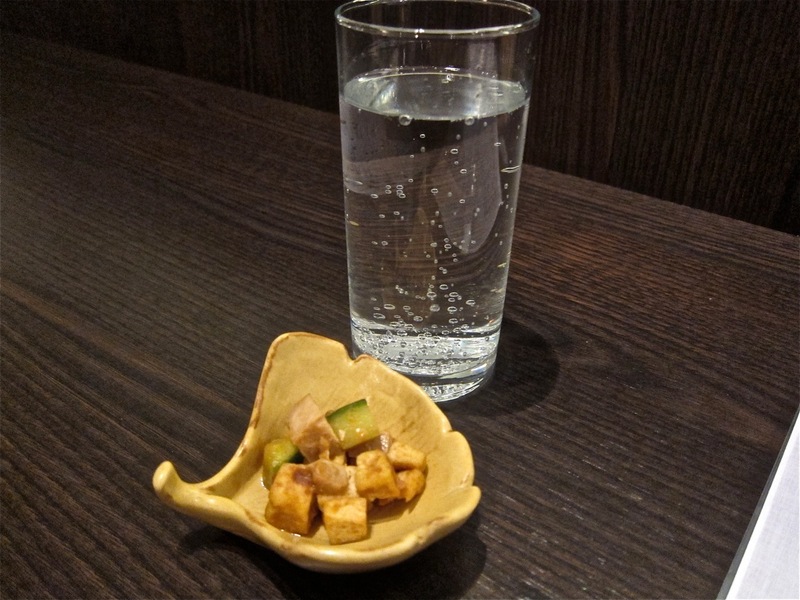 We received a gift of diced chicken, tofu, and cucumber marinated in a soy-flavored sauce. We got straight into ordering the grilled meats. They go for 60 CZK for two skewers. We had all of them with the tare sauce. First up were the tori momo or chicken thighs. 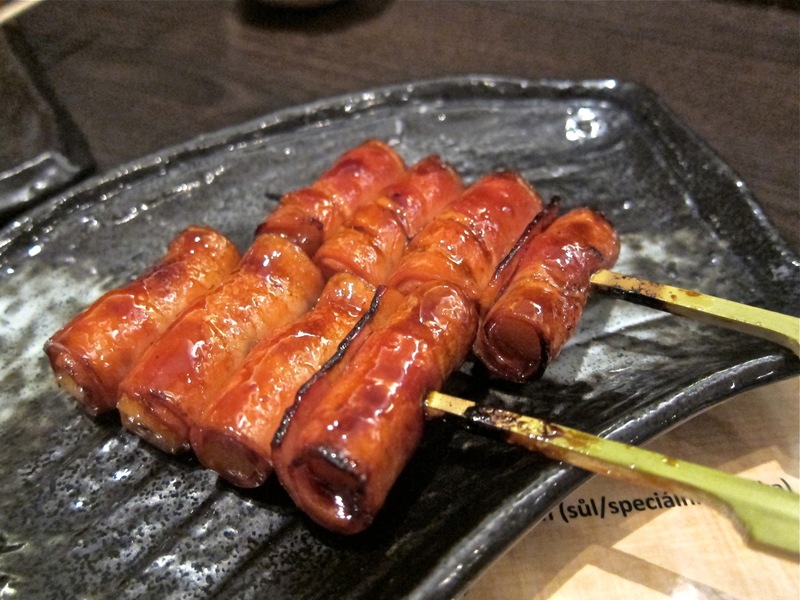 Juicier than breast meat, these hot, succulent morsels with sweet glaze and a slight char were a pleasure. Then came the gekkikara tsukune, which is a spicy mince of pork, chicken and beef on a stick. It had plenty of kick and is not for the weak of tongue, but it'snot deadly hot, either. Third, we had the mochi-bacon. These are sticky rice cakes wrapped in bacon and grilled. The lean pork remained soft and ham-like. This was interesting, but not as decadent as I imagined. I probably wouldn't get that again. For the last round, we had the buta bara, or pork belly. I was expecting something fatty, but it was very meaty, though not too tender. I liked it, but I'd probably rate the chicken as the best we had. There are also grilled chicken livers, hearts, and stomachs, but I wasn't in the mood for offal. 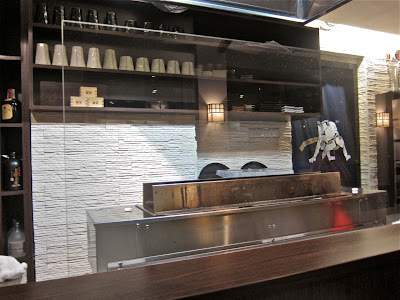 Next time, I'd try the gyu hire or beef tenderloin skewer. 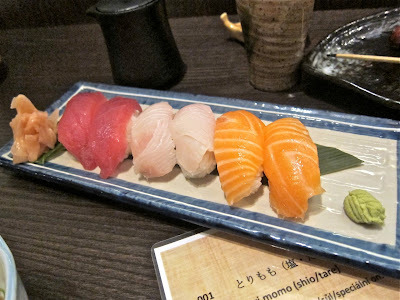 We were eager to try the grilled meats first, but then realized we wanted to sample sushi and appetizers. From the nigiri menu, we ordered tuna (200 CZK), yellow tail (180 CZK), and salmon (140 CZK). The fish was fresh and buttery tender. There was only the slightest hint of wasabi between the fish and the loosely packed rice. The rice was rather bland side, with almost no flavor of rice vinegar or wasabi. It was decent nigiri, but I didn't feel it was so special that I wanted to pay that much. Each order is two pieces. 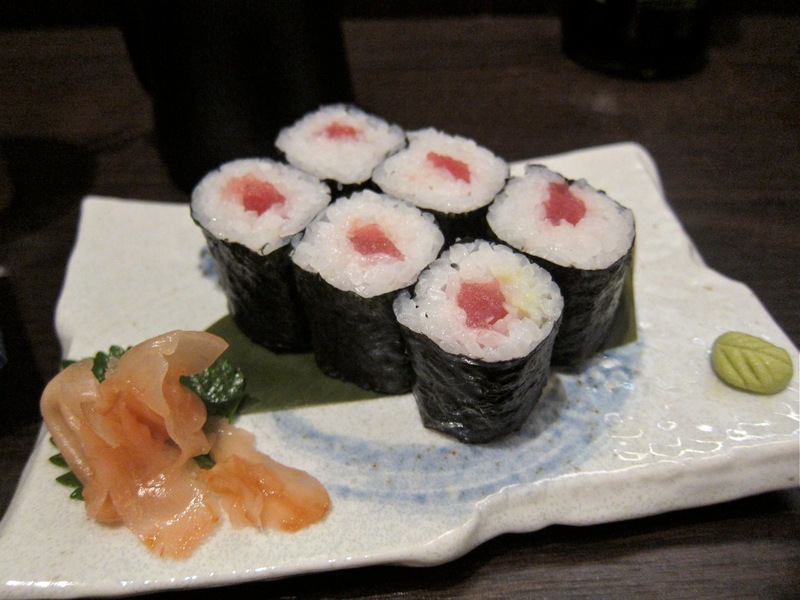 For perspective, The Sushi Bar charges 298 CZK for two tuna nigiri, Miyabi's cost 180 CZK, and Sushi Tam Da's would be 76 CZK (according to their websites). 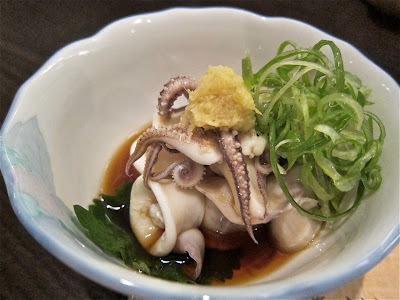 We tried the ika no yubiki or little squid (150 CZK). It was a small portion in a small bowl. But this was probably our favorite dish. The very fresh and tender tentacles and rings of flesh bathed in a vinegary soy with a clump of finely grated ginger that mixed in. Small, yes, but in this case, I thought it worth the big price. We wanted a seaweed salad, but they didn't have the usual wakame. Instead, they offered a type I hadn't seen before called mozuku su, which is farmed in Okinawa (150 CZK). 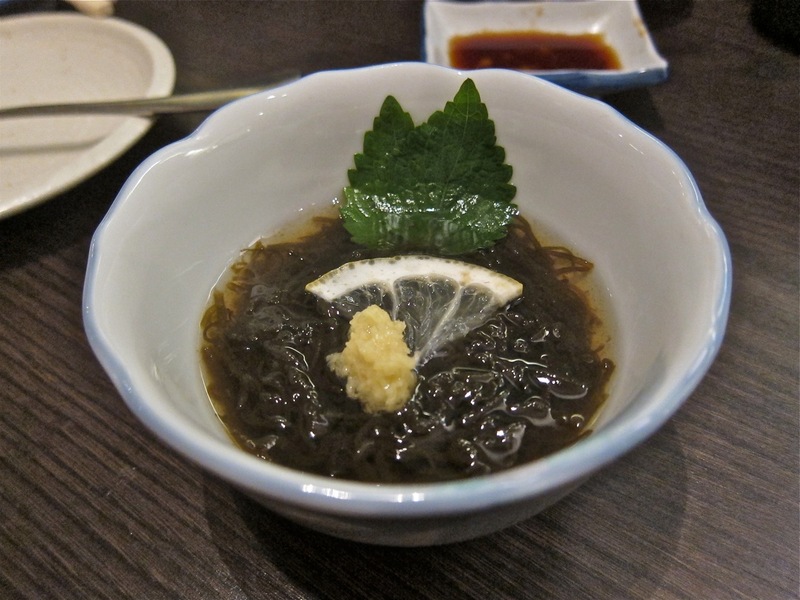 The small, teacup-sized bowl was filled with delicate, slimy brown tendrils of seaweed with vinegar and ginger. It was a unique flavor and texture that I enjoyed. I was glad I tried it. But I probably wouldn't pay that much again for so little. My friend was in the mood for some maki. Their selection of rolls is limited and conservative by American standards. We had the tekka maki (220 CZK). They were a little larger than many places, but the tuna in the middle was small. It was very basic and not cheap. 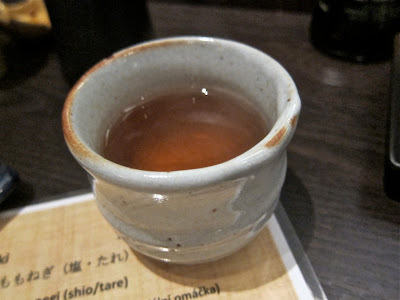 During the course of the meal, we received a gift of tea. Finally, I wanted to try another hot dish. I briefly considered the full order of the gyu hire or beef tenderloin. Instead I got the ebi chili (220 CZK) and rice (40 CZK). 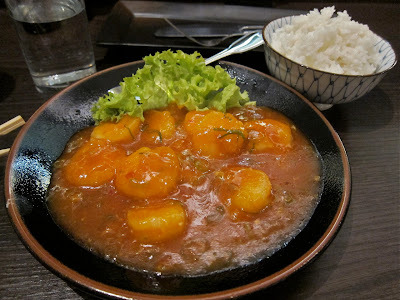 This was a kind of basically sweet and sour shrimp. The small, delicate, snappy shrimp come in a thick, jelly-like sauce. It is not as sweet as it looks and was balanced with tart and savory flavors. It wasn't bad, but I'd try something else next time. But what about you? Why shouldn't you go? When Hospodářské noviny sent a photographer for their story on Yakumo, no photos were allowed. "We have enough people," they were told. When I was there, the chef told me a "business man" complained about me taking pictures (thus the extra blurring of those shots). He asked me to stop. I told him I just wanted to take more pictures of the food for my friends on the Internet. The chef said they didn't need more business and the menu is only in Czech and Japanese, so it wasn't good for English speakers like me. I told him in Czech I knew many people who understand Czech, and he finally relented. What I liked most about Yakumo was the yakitori. I'd have that and some beers. I tried an assortment of other stuff on the menu to get an overview. That "other stuff" boosts the bill quite quickly. The final tab was 1640 CZK. And things do move fast there. We were in an out in just over one hour. Still, even if I am not wanted or needed, I'd go back again. I just hope it's not too crowded. Good Post. Would not use, as I am not a Fan of Japanese Food. Stay with a Friend in Praha. If I needed a Hotel. 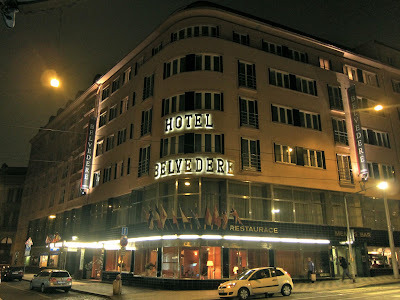 Hotel Belvedere, would Probably be it. Love the Area. Had a Good Lunchtime in a Trad CZ Bar up the Road. Klasterni Pivnice Sumavan.Couple of Days ago. Could have Gladly Stayed, all Afternoon. BTW, from looking at the pics, without reading ur comment. I also found the squid salad the most interesting.. I was wondering, the minced yellowish thing on the top is that ginger ?? ?